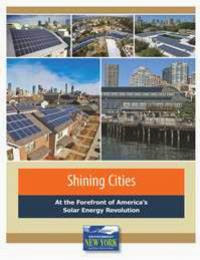 Environment New York held a news conference on April 13, in Albany to release, "Shining Cities: At the Forefront of America's Solar Energy Revolution," a first-of-its kind comparison of installed solar in major cities across the US. According to the report New York is the 8th largest solar state in the country. The report reviews the impressive growth of solar in New York City and Buffalo. The report also highlights the importance of strong local policies and programs in the development of a robust solar industry in these major cities, and calls out specific cities from the list of those studied for their implementation of best practices.